I'm organic. Crispy + melty. Just yummy organic snacks for babies. No concentrates. No additives or colourings. 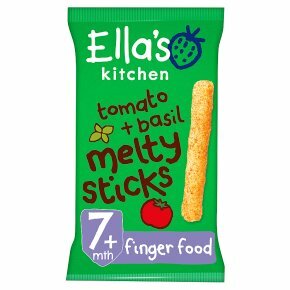 No added sugar or salt - I contain only naturally occurring sugars.Hello, I'm organic tomato + basil maize sticks. I'm a fun + tasty finger food made for playing and learning, with less mess. Who am I for? I'm made for babies from 7 months. I'm just the right size + shape to help little ones learn to get food into their mouths and keep their little gums busy, whilst being super melty. Warning: I'm not suitable for babies under 7 months old. When a baby over 7 months is munching me, make sure they're sitting down and are supervised by a grown-up to reduce the risk of choking.